C.J. 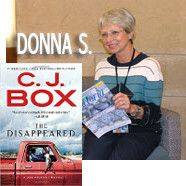 Box is an award-winning author whose works have been translated into 27 different languages. His Joe Picket mystery series follows the life of a game warden in the modern West. The latest one is The Disappeared, in which a female British executive disappears during a vacation at a four-star dude ranch. Was she kidnapped or just on a longer vacation? I. Read a book involving travel.